Feyre's survival rests upon her ability to hunt and kill - the forest where she lives is a cold, bleak place in the long winter months. So when she spots a deer in the forest being pursued by a wolf, she cannot resist fighting it for the flesh. But to do so, she must kill the predator and killing something so precious comes at a price ... Dragged to a magical kingdom for the murder of a faerie, Feyre discovers that her captor, his face obscured by a jewelled mask, is hiding far more than his piercing green eyes would suggest. 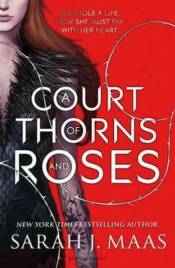 Feyre's presence at the court is closely guarded, and as she begins to learn why, her feelings for him turn from hostility to passion and the faerie lands become an even more dangerous place. Feyre must fight to break an ancient curse, or she will lose him forever.